When the May 2010 general election produced a hung parliament, Andrew Adonis and other senior Labour figures sat down for talks with the Liberal Democrat leadership to try to persuade them to govern Britain together in a Lib-Lab coalition. The talks ultimately resulted in failure for Labour, amid recriminations on both sides. Despite calls for him to give his own account of this historic sequence … of events, Adonis has until now kept his counsel. 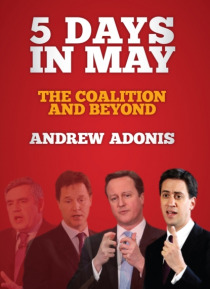 Published to coincide with the third anniversary of the general election that produced the first coalition government since the Second World War, 5 Days in May is a remarkable and important insider account of the dramatic negotiations that led to its formation. It also offers the author's views on what the future holds as the run-up to the next election begins. 5 Days in May presents a unique eyewitness account of a pivotal moment in political history.